Which Driver is at Fault for a Rear-End Accident? After any type of car accident, it’s important to determine who was at fault to understand your legal rights and options. For example, if someone hits the back of your car, are they automatically at fault? In New Jersey, the answer in most cases is – yes. Of course, there are exceptions, so the best way to identify liability in your case is to consult with an experienced NJ car accident attorney who understands New Jersey law. New Jersey has a law that prohibits drivers from following other cars closer than is “reasonable and prudent.” Drivers should take into account the speed of traffic, weather conditions, and road conditions when determining a reasonable distance. Generally speaking, a reasonable distance would allow a driver to stop in time to avoid a collision, which is believed to be one car length for every 10 miles per hour of speed. If you are traveling 60 miles per hour on a highway, how often is another driver actually six full car lengths behind you? Not often, and this can be seen as a violation of traffic laws. Drivers have a duty to abide by all relevant traffic safety laws and to maintain control of their vehicles at all times. When a driver is following someone too closely, and the front car must suddenly slow down or stop, the rear driver is responsible if they can’t keep control of their vehicle in order to prevent a collision. Even if a rear driver claims the front driver slammed on the brakes, the law still maintains that the rear driver should be back far enough to react. Distracted driving is another major cause of liability for rear drivers. Even if a driver is far behind the front car, if they look down at a phone for a second, they can miss brake lights ahead of them and fail to slow down. Can the Front Driver be at Fault? ● The rear driver was following at a safe distance when a car from an adjacent lane dangerously changes lanes and “cuts off” the rear driver, making it impossible for the rear driver to have a safe distance or avoid a collision. ● The front driver failed to maintain their vehicle and do not have working brake lights. The rear driver has no signal that the car is slowing down and crashes. ● The cars are stopped at a stoplight, and the front car puts the car in park for the minute. When the light turns green, the front driver puts their vehicle in reverse instead of drive. 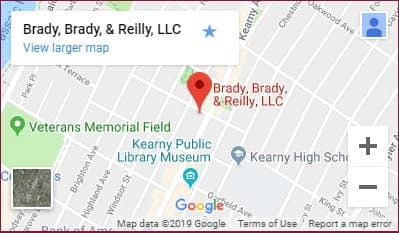 Brady, Brady & Reilly, LLC represents victims of all types of car accidents, including rear-end collisions. If you would like to discuss your legal options, please don’t wait to contact us online or call 201-997-0030 to schedule your free case evaluation.